I just bought a boat that I plan to trailer. It’s a fiberglass I/O drive. It’s still in the water now. It’s covered in barnacles (drive and hull) and growth below the waterline. I’ve gotten under it and scraped off most of the bulk growth. My question is what is your suggested regimen to free the hull and drive of the barnacles and stains? Move the boat and trailer away from the waters edge to avoid polluting the water. Use a pressure washer or scrub brush to knock off all the soft growth, algae, slime and anything else that you can get off this way. 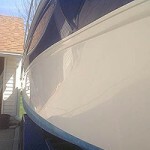 Apply Algae Strip to the fouled hull by starting at the keel and roll the Algae Strip onto the fouling, up to the waterline and back down again, until the entire hull has been coated. Wait 20 to 30 minutes. Use a scrub brush to knock off the barnacles. If they are mature and well attached, you will have to scrape them off with a scraper made from hard wood or plastic that is stiff enough for the job, but will not scratch the fiberglass. Re-apply and brush or scrub if still necessary. If deep stains remain, try Waterline Stain Remover, using the same application. 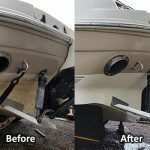 If you have scuff marks, rust stains or other stains that these cleaners do not remove, use Boat Scrub with a cloth to rub out the remaining scuffs and stains. First: please be responsible. Move the boat and trailer away from the waters edge during the cleaning process to prevent the effluent from going into the water and polluting it. Do not clean the bottom on your dirveway as the effluent will go into the storm sewers and directly into the waterway without treatment. If you spill or splash any of the chemical, it may damage your asphpalt or concrete. Second: Algae Strip and Algex are acid based cleaners. Wear protective clothing, eye protection and rubber gloves and try to work up wind as they are not pleasant smelling. 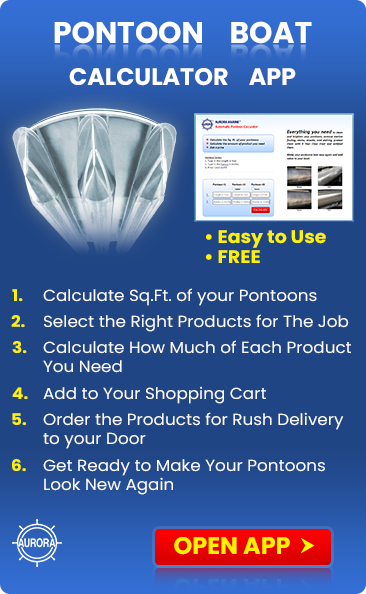 Protect your trailer with plastic garbage bags or sheets. If your boat is on a trailer go to Ask The Skipper > Bottom Cleaning > "How to raise your boat off the trailer", to get information about getting under the bunks or rollers. 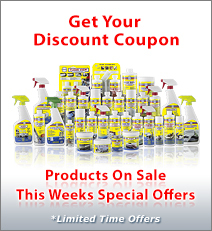 There is more information here about cleaning, restoring and protecting your boat. As soon as you haul the boat, use a pressure washer or scrub brush to knock off all the soft growth, algae, slime and anything else that you can get off this way. It will save you time and money over the long haul as you will use less cleaning product and the cleaning will go faster. Next: apply Algae Strip to the fouled hull. Algae Strip is not intended for the sterndrive or props. Use a plastic paint tray to pour the product into and a paint roller with a plastic core and a long handle. Start at the keel and roll the Algae Strip onto the fouling, up to the waterline and back down again, untill the entire hull has been coated. 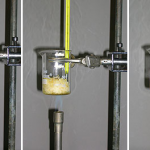 Wait 20 to 30 minutes for the chemical to work. This should get rid of any remaining algae and slime and loosen up the barnacles. Try using a scrub brush to knock off the barnacles. If they are mature and well attached, you will have to scrape them off. Use a scraper made from hard wood or plastic that is stiff enough for the job, but will not scratch the fiberglass. Use a garden hose to rinse clean. Depending on the extent of the growth, you may have to repeat this several times untill all of the barnacles are off. After you remove the shells, its common for the barnacle adhesive (barnacle rings) to remain. Re-application and scrubbing or scraping should get all of the adhesive material off. Algae Strip cleaning normally gets the stains out as well. If deep stains remain, try Waterline Stain Remover, using the same application. 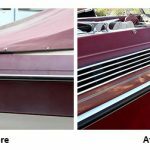 If you have scuff marks, rust stains or other stains that these cleaners do not remove, use Boat Scrub with a cloth to rub out the remaining scuffs and stains. To Clean the Stern Drive, Props, Trim Tabs, Transduces and other underwater fittings that are not fiberglass, use Algex. Pre-clean as above and then spray the Algex onto the fouling, making sure that it is well covered. Wait 20 to 30 minutes and then scrub or scrape as above. This may take several applications. Algex does not normally remove factory finished finishes, but it may remove aftermarket paint and may require retouching with outdrive spray paint. 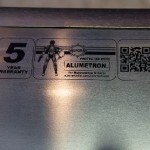 Algex does not damage metal and will brighten stainless steel or bronze props. I suggest that you remove the water intake plates on the stern drive to make sure that the water intakes are not fouled or blocked. This is a common problem and can cause mechanical problems later. Use a small scrub brush, or a parts washing brush, to get into the nooks and cranies around the transducers, trim tab hinges etc. Rinse clean with a garden hose.